Learning from each other : The Göttingen eResearch Alliance is an initiative of the University of Göttingen to assist all researchers on the Göttingen Campus (GC) with eResearch related questions and Data Management issues. 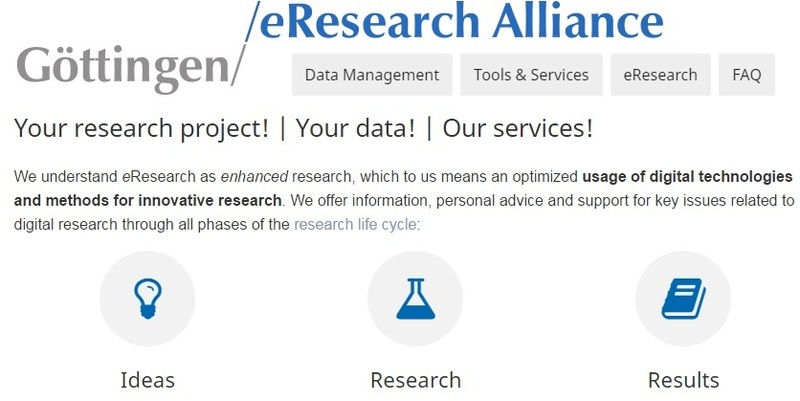 As a central point of contact for researchers, research associations and faculties the eResearch Alliance represents the University's joint forces of the central infrastructure providers, the Göttingen State and University Library (SUB) and the Göttingen University's Computing and IT Competence Centre (GWDG). "is 21st-century discovery through the application of advanced computing and information and communication technologies. These technology-enabled research practices have become a game changer in the pace and depth of research discoveries - so much so that gaps are already beginning to appear between those institutions with a clear strategy for effective eResearch support and those that don’t. In the age of big data and large-scale international collaboration researchers require dedicated, specialist IT support. Without which they risk diverting time and resources into the development and maintenance of potentially substandard or inefficient solutions, or just taking much more time to do meaningful analysis". The Göttingen eResearch Alliance understands eResearch as enhanced research, which to us means an optimized usage of digital technologies and methods for innovative research. eResearch technologies enable researchers to create and collect, analyse, preserve and publish digital research data, and to work collaboratively in virtual teams that cross disciplinary, institutional and national borders by using Virtual Research Environments (VREs). This ongoing technological change is fundamentally transforming the way researchers work across all scientific fields. Visualisation techniques that enhance the interpretation and presentation of data for example are especially of interest for analysing very large data sets or complex data. Open Access to publications and research data enables (re)use and application of research results, increases impact and enables critical evaluation. Research funders and institutions world-wide acknowledge that Open Access to research findings improves the transfer of knowledge and promotes collaboration and innovation. Creating a scientific visualisation can be an important step in the research process. It means to explore, analyse and represent research data. As the amount of research data has enormously increased during the last decades, the difficulty to understand research results by direct inspection grows more and more. A good method to address all relevant aspects related to the management of research data is to use a checklist or to write a data management plan (DMP). Such a plan is not only an essential first step to take at the pre-project stage, it can also be very useful to refer to and adapt throughout the project [an increasing number of funders require new research proposals with research data to be accompanied by a DMP]. DMPs are meant to encourage researchers to reflect on the lifecycle of their data before starting out on their project. If the data have already been published, they should be made available in non-commercial, digital databases along with the metadata. while it may seem as if a RDMP creates extra workload it can help you to save time and nerves in time-critical situations during the projects runtime.